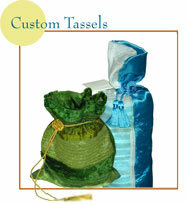 We offer a wide variety of tassel constructions and materials from which you can create a tassel to suite your project. Please review the options below, then contact customer service at 800-858-6966 to discuss your needs. 3. Pick a knot style. 4. Pick a tassel material. 6. Pick a loop material. 7. Click here to request a quote or sample.